1 pkt spaghetti, cooked in salted boiling water until al dente. Mix all the meatball ingredients together until well combined and roll into small meatballs (about a heaped teaspoon full for each). In a large pan, brown the meatballs in a little olive oil (to seal and for colour). Saute the onions and garlic in the same pan until soft and glossy. Add the passata, wine, balsamic vinegar and brown sugar. Bring to a simmer and add the meatballs. Cook uncovered for +- 20 minutes. Season and stir in some fresh basil. 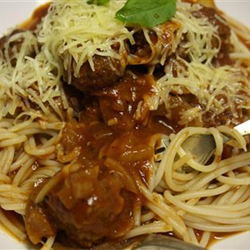 Toss the cooked pasta in a little olive oil and place into bowls, top with a few meatballs and pour over some delicious sauce. Garnish with fresh basil and generous amounts of grated pecorino or parmesan.